There are myriad reasons why getting from Earth to Mars is hard, but chief among them are two 1) the massive amount of fuel needed and 2) a launch window that is limited to every 26 months, when the two planets are in optimal alignment. A couple of mathematicians have calculated a new path to Mars that solves both, and it’s far from a straight line. Mapping a route to Mars, of course, is more complicated than mapping any Earth-bound route. The distance between the two planets is constantly growing or shrinking, depending on their orbits around the sun. (That’s why the optimal launch window only opens every 26 months.) And you have to take into account how gravity from the Earth, Mars, and sun will pull a spacecraft off its course. Mathematicians Francesco Topputo and Edward Belbruno have calculated a path that actually takes advantage of the Mars’ own motion. The strategy is called ballistic capture, as opposed to what we now use, the Hohmann transfer. 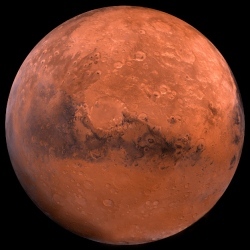 A crucial detail is that the spacecraft will no longer need hundreds of litres of extra fuel to brake as it approaches Mars. Twenty-five per cent fuel means less weight, which means a smaller and cheaper rocket to boost the whole thing into space. Or, alternatively, more stuff in the payload.